You hear it often: dating today doesn’t work like it used to. Or: apps like Tinder have made flirting more distant. But the process of staring, judging, and messaging potential suitors from afar—hallmarks of modern dating apps—is not new. Beginning in the 1920s, nightclub-goers in Berlin who feared face-to-face encounters could communicate with beautiful strangers from across the room. All they needed to do? Turn to the nearest pneumatic tube. Two nightclubs in particular—the Resi and the Femina—pioneered the trend. At the Resi (also called the Residenz-Casino), a large nightclub with a live band and a dance floor that held 1,000 people, an elaborate system of table phones and pneumatic tubes allowed for anonymous, late-night flirtation between complete strangers. A Chicago Tribune article describes the Resi’s “nightly ‘spectacular’—‘a dancing water ballet’ with jets of water rising and falling to a recorded symphony while colored lights flash.” The water-jet ballet, now known as a “Waltzing Water,” began in 1928 and drew in many visitors. Phones were fixed to individual tables, and above many was a lighted number. Singles needed only to look around the room until a fetching stranger caught their eye, note the number, and then direct a message to that table. “Lonesome Americans, and others, can call or send a note to equally lonesome women who look like they would enjoy company,” the article noted. Similar systems thrived at the Femina, the larger of the two nightclubs, which boasted more than 2,000 seats, “two large bars and a smaller one in the vestibule, in addition to three orchestras, a hydraulic dance floor,” and over 225 table telephones, which were accompanied by instructions in both German and English. 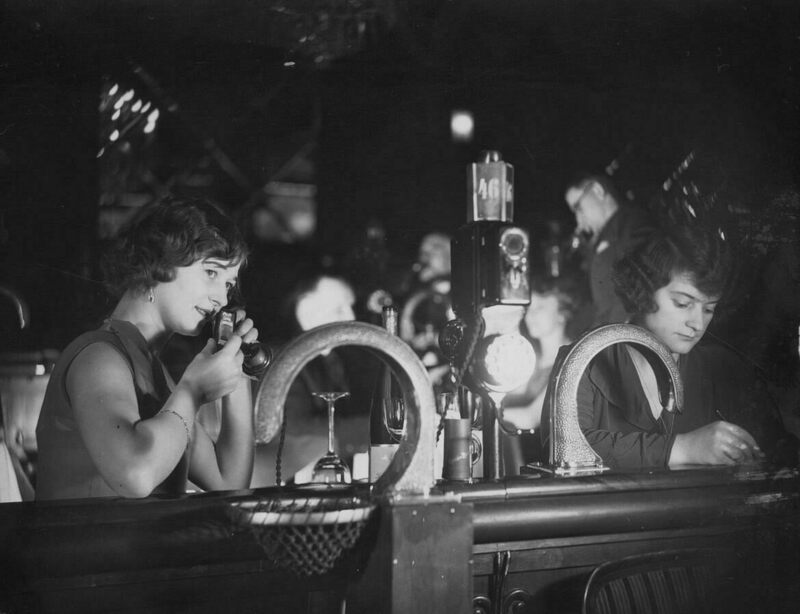 But for those who were too shy to pick up the phone, the pneumatic tubes offered a perfect alternative. The tubes were built into the handrails, and one was located at each table. The nightclub provided paper on which to scrawl notes. Patrons only had to specify where they wanted their missives sent. Like messaging on a dating app, but with—you know—tubes. At the Resi, many provocative notes were passed around, but eager flirters needed to be careful—“messages sent by tube [were] checked by female ‘censors’ in the switchboard room” in an early form of comment moderation. The pneumatic tube system existed for decades, and Americans who visited Berlin after World War II remember it fondly. This “table mail service” was real, and allowed patrons to send more than just a handwritten note to that handsome stranger across the way. The Resi offered a long menu of gifts that visitors could dispatch via pneumatic tube—including perfume bottles, cigar cutters, travel plans, and, according to one source, cocaine.